I had the pleasure of being shown the ways of scooting by @Documentally and the video evidence is for all to see. 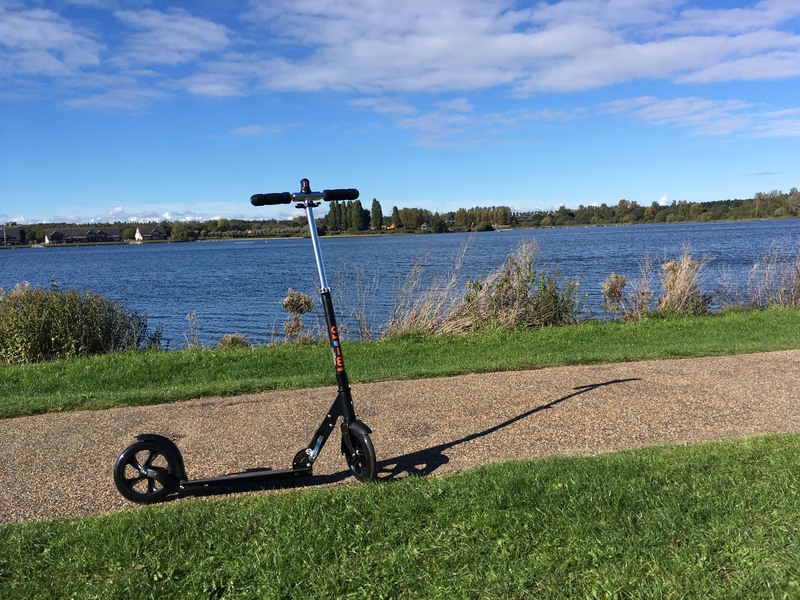 Many people that get into scooting, do it via “The kids”. There are some epic blog posts about parents getting them to join in with the kids but they didn’t really resonate with me. I’m a growd up don’t you know and I don’t have any kids! But is it just a toy? A pointless fad? Anyone that knows me, knows I don’t do gadgets – I have too much stuff in my life and only like to keep things that I love and/or use. My first scooter has arrived and I am completely converted. Every time I go out, I end up sharing it with someone. They, like me, end up grinning like a loon. My neighbour, Nick’s quote “these are built for Milton Keynes”. He’s not wrong! Not gonna lie, I was a bit scared to start with, particularly of the hill next to my flat. “How good are the breaks? “, “how much will it hurt if i stack it?”. Needless to say I didn’t need to worry, just be confident…. so i ended up riding my hill in the dark. Talk about baptism of fire ???? I’ve already had the “aren’t you a bit old to be scooting?”. Grin like an idiot and shout “Never!” whilst travelling as fast as my feet will propel me. So, as with all these things, I need to justify the purchase. Mainly to my other half but also to me. Do I NEED it? Here’s a little insight into my thought process. First up, how much time does it save? Here are the https://runkeeper.com results of my trips from the local train station, both on foot and using the Scooter. Some context: – The route has a large “up hill” section – I am walking (and being towed by the dogs) in the rain so it is a little faster than normal. 15 minutes vs 45 minutes! Whatever your decision, for me, it is fun exercise that has saved me time and has become a daily addictive habit. I cannot wait for the Summer of 2017. I was reading my usual news feed when this article from LondonCyclist.co.uk popped up. Since getting my Micro Scooter, I’ve been loving the carefree, death defying rollercoaster that is the hill near my flat, in the dark. However, it’s probably about time to fit a light. So based on the review, I ordered a Knog Blinders MOG and it has arrived! Does it fit a Micro Scooter? I’m going to probably place it higher up the stem but will let you know how my testing goes. Does it light a path or warn others of their impending potential collision? All in all, really great bit of kit. Plus it fits on my Brompton when doing bigger distances. Next up – fitting 120db air horn…. Have you watched Stranger Things yet? I am sure I am not alone in walking away feeling inspired to play Dungeons & Dragons again. Rose tinted glasses. The reality being that I am forgetting the complexity and size of the manuals, just to start a simple game… might have to pass. That being said, everyone loves a good board game right? Ignore the monopoly politics & family feuds over Cluedo, can’t beat a good game of mouse trap or opertation? If you have taken a dive into board games, you quickly realise that the best games are made by the Germans. Games such as Carcassone, Settlers of Catan or Agricola are amazing, minimal time to learn to play, lifetimes to master and fun for everyone. Unfortunately, most people haven’t heard of them as they are not mainstream. They reside in the corner of Waterstones hidden or relegated to speciality games shops that terrifies people. Why the preamble? Simple, Time Tracking is exactly the same. If you take a deep dive and use an all singing, all dancing program to time track – it’s all to much for most of us. Not only does it look like a D&D style D8 (eight sided die) but it is the ultimate time tracking desk toy. Working as a freelancer is fun and equally tough. I spent a period of time in my life where I was working hard but the money coming in was not reflective of the work I was doing. I had a vague idea where it was going but could give no specifics and couldn’t change it either. Not only was this hurting my ability to “drink and eat” but I was massively devaluing what I do and misrepresenting the time it takes to do a job. I’d tried any number of time tracking apps on both my phone and my computers. I would start with good intentions but I always forgot to start/stop/pause a timer and ended up doing more work fixing the timers that it was supposed to be saving. This was no reflection on the many great software packages out there and more telling about my ability to get lost in the chaos of day to day. I saw an opportunity to Beta test a bit of kit that would track my time…. look at it, seems wierd right? So I ordered a ZEI° and this lovely desk device was delivered with the care attention that you would expect from a new parent delivery a first Christmas present to their child. I installed the apps (they are available for all Platforms) on my iPhone, iPad & Mac and jumped in with 2 feet. Label that side(face) as you see fit…. I used stickers becuase they are fun! As you do things, turn the ZEI° over to the appropriate side and it does the rest. You can add notes as you change side. Which I do, so I can see who I was “telephone” calling with or “email” -ing. If you happen to use Toggl, there is a cool integration of the two. And there are more planned. The team behind ZEI°, are a great bunch and always happy to help. I am proud to have been one of the first 100 people in the world to Beta test this. I put my cold hard cash down to do it and I love it. They still have another 2 weeks to run and smashed their funding goal already. What a weekend and a break from my normal “tech stuff”! Time with the epic Ian Freemantle (here: https://www.facebook.com/IanFreemantleWoodSculptor/ or here: http://www.ian-freemantle.co.uk) hosted by the Greensand Trust (http://greensandtrust.org) on his Wood Sculpting course. I cannot recommend this highly enough! Fabulous people on the course (Tom, Jo & Dave), a lovely open fire and some welcome company from Chloe & Stick (the dogs!). Here’s a little of our story, the rest shall remain in our memories and but you could be on the next course? Tom made his own chair!! Hayfever – I herbal banish you! The summer is here and so is my hayfever! I know that this affects many, many people and I definitely subscribe to the thought that it changes from year to year. I’ve tried Antihistamines, with Loratadine being my weapon of choice. Despite it being “non drowsy”, I certainly notice it knocking the edge off me, at best. More often than not, I spend my days spaced out during the summer grass pollen season. Then I stumbled on a an “airy fairy hippy” solution to hay fever and boy does it work (for me!). James Wong and his Camomile, Honey and Nettle Tea is working wonders. I am currently on year 2 with no further need for the prescribed drugs. If you suffer with Hay fever, I cannot recommend trying this highly enough! This is my egg skelter and I love it. My best friend had one a few years back and I thought it was ingenious. Needless to say, we’ve had this now for a few year and both love it. It is a kitchen item that any visitors to our home, love to play with! So I was very lucky to get a ticket for the MK Geek Night All Dayer and what an epic day. Great people, discussions, food, drink, location and sooo well organised. I was only taking a few snaps but here are mine from the day, they bring back memories for me, I hope they do the same for you.